I’ve been meaning to start this blog for several months, but I keep finding all sorts of fancy excuses not to: work, too tired to write, “when I have time”, yadda yadda yadda. But rather than waste another sentence on my brilliant procrastination skills, I’ll just move on and share with you the purpose of this blog. This is, after all, my first official post, so I’d better make it good, right? Though now that I’m actually writing, I’m seeing that perhaps I have been stalling this process out of fear of this actually being my first post. It’s that “first timer” syndrome, which is quite silly when you really think about it. Because that would suggest that I’m attached to my ego, and considering that the objective of this blog is to share with the world my everyday happenings which I experience through the lens of a butch buddhist, one might suggest that I should have NO attachments – let alone attachments to my ego. Ah, but there lies the dilemma. What I should be doing and what I am doing are quite often two different realities. With that being said, allow me to introduce myself and my blog. Like the blog title suggests, I identify as both a butch and a buddhist. I’m not one for labels, but I am one for contradictions (much like buddhism, and on a bad day, much like butchism). I had a previous blog that I maintained for two years, which tracked my midlife crisis, which ultimately led to my residency in the San Francisco Zen Center for one year. But that period of my life is over, and now I am moving forward – back in the marketplace. Things feel a lot more clear to me these days compared to two years ago. On October 1st, I took what is called jukai, which is basically a lay ordination ceremony in the zen buddhist tradition. It means I have formally taken the precepts, which are guidelines to living (things like “I vow not to kill”, “I vow to maintain right speech”, etc.). I am – hoping – that this blog will help me maintain some accountability, though I am leery to set myself up for disappointment. Perhaps “accountability” is too strong a word; rather, my intention is to maintain a weekly commitment to check in with myself in this bog. To look at my week and “observe the observer” as my teacher likes to say. To explore on a deeper level how I am truly applying these precepts into my daily life. 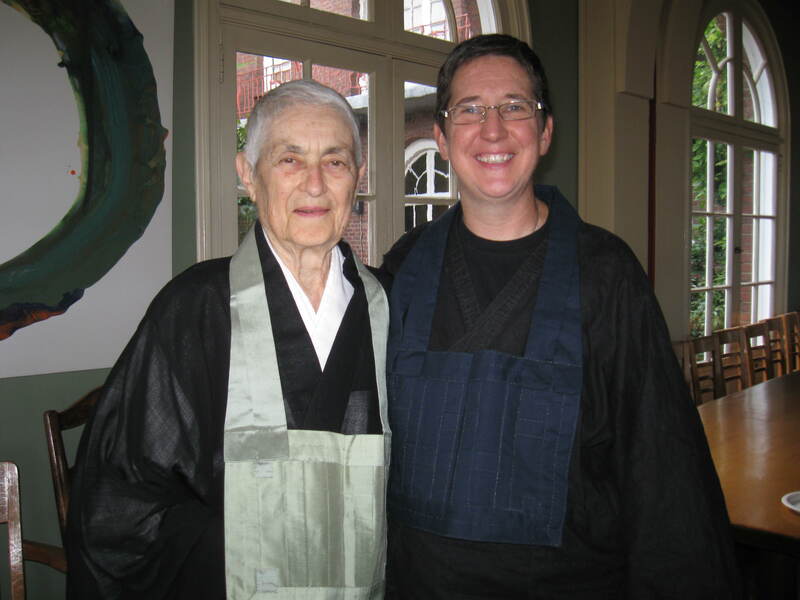 When I moved into the Zen Center in the spring of 2010, it felt like I had come home. The daily zazen, the chanting, the ritual, the intimacy of the sangha life all felt very intuitive to me. But what really popped out to me in a glaring way was a question I had about western buddhism, which is “What exactly is western buddhism?” The Zen Center is criticized by some as being a bit to Japanafile, but a healthy argument to that could be that its founder is from Japan (Suzuki Roshi), and his young American followers back in the 70’s were simply following directions (which is something young Americans tend not to do). The monastic life, even in the west, nurtures the soul and disciplines the mind. It is something I may return to some day, but I am compelled to be out in the world these days, full speed ahead, precepts in motion, so to speak. I can chant until my tongue falls out of my mouth, but if I can’t get along with my colleagues, my father, my girlfriend (take your pick) then how true am I being to my practice? How able am I to apply these precepts? How effective am I as an educator (I am a teacher by trade). How am I navigating my way through this thing called life now that I have embraced the precepts? Ideally, I would love to use this blog as a forum to explore everyday buddhism in the west. But, more importantly, I would like to use this as a forum to explore how we all navigate our way through this thing called life. Do we need precepts to thrive? What is it that motivates us to show up each day with pure motives? Where do we draw our energy from? How do we pull up the bootstraps on a bad day? Or are there even bootstraps to pull up? Let me give you a sprinkling of where I’m at these days. This week, I went to the Zen Center to stay there as a guest student for two days. (I moved into my own place in June because I wanted to get my dog back, who is one of my greatest buddhist teachers). I went to the Zen Center because this past semester was an extremely long, tiring semester. I needed to decompress. After using my brain for the past 4 months, I wanted to get back into my body. Sweeping floors, chopping vegetables, and waking up at 5 a.m. to meditate with the sangha is my way of relaxing. It was also wonderful to see some familiar faces. My intention was to stay for three days, but by the first day, life on the outside beckoned me. My girlfriend, who was graciously watching my dog (who is on antibiotics and reluctantly wearing a paw bootie from a recent injury) was having problems with her back, so I had to cut my stay short. As I was walking around the temple saying goodbye to everyone, the tenzo (the person in charge of the kitchen), Rose, who was carrying some persimmons, looked at me, then looked at the arm full of persimmons, and said, “Do you want a persimmon?” It was just so simple, so sweet, and so pure of her to offer whatever she had in that moment to give to me. She completely met the moment, which really captured my heart. This is the season of gift giving. In buddhism, there is the story of how a young girl named Sajatya fed the buddha who was starving to death because he thought he had to be extreme and not eat. But the truth is once he got a little bit of nourishment in him, he was able to build up the strength to sit under the bodhi tree until he finally reached enlightenment. Today, during oryoki (formal meals), one of the meal chants that we use refers to “the giver, the receiver, the gift”. So, on this shortest day of the year – I want to wish you peace and joy. Enjoy a persimmon – enjoy giving, receiving, and being the gift. So glad to see that you have a new blot my wonderful friend! I have really missed reading your thoughts and experiences, and having a way to stay connected with your new life.